There is nothing quite like exploring a homify 360, which makes the most of several different styles. It is a brilliant way to see how styles and themes can collide, creating an impressive, innovative and inspiring result. Today's design, by Taco Taller Architects, is a wonderful display of rustic meets modern. A house that looks like it is almost entirely made out of stone and clay turns out to be one of the most sophisticated houses that we have explored in a very long time. As Confucius once said, Life is really simple, but we insist on making it complicated. Let's see just how beautiful simple can really be. From the exterior of the home you can see what we mean by the clay/stone look and feel. 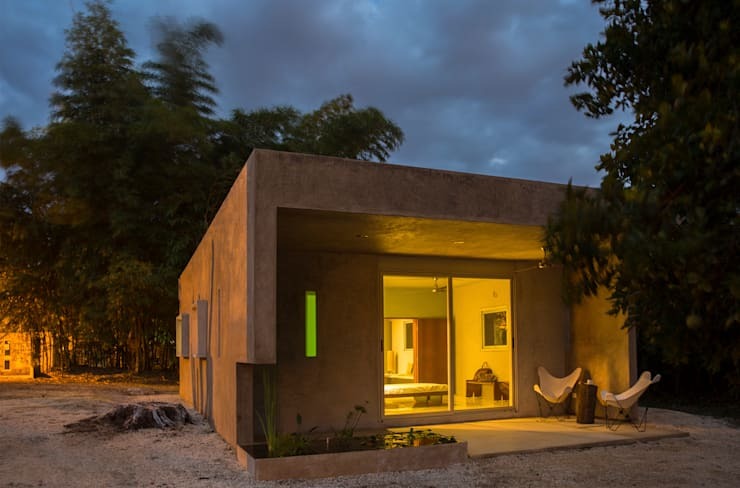 It looks like this home has been chiseled out of the side of a mountain! This gives the home a very inviting and warm earthy look and feel. The rustic style is also very prominent. Have a look at this: Simple guide to a rustic home style. The shape and style is very basic otherwise. The home is a simple one-storey design, with large glass windows that open the house up onto a cosy terrace. 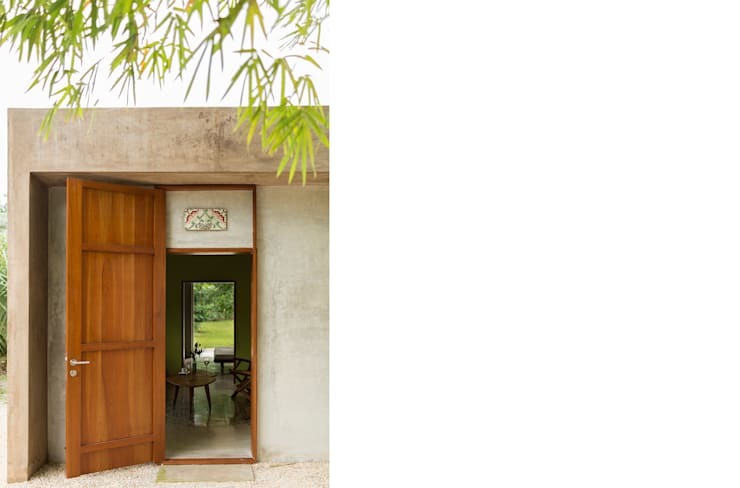 We can see that the home works in harmony with the nature that surrounds it. The green trees and colourful flowers create a natural form of decor. Wouldn't you feel so at peace sitting on this little terrace? If we head inside the home, we can see how the modern design collides with the rustic setting. While there isn't a large amount of space available, the kitchen and dining room flow into one another thanks to the open plan design, which is further enhanced by the bright, patterned flooring that connects the two spaces to one another. 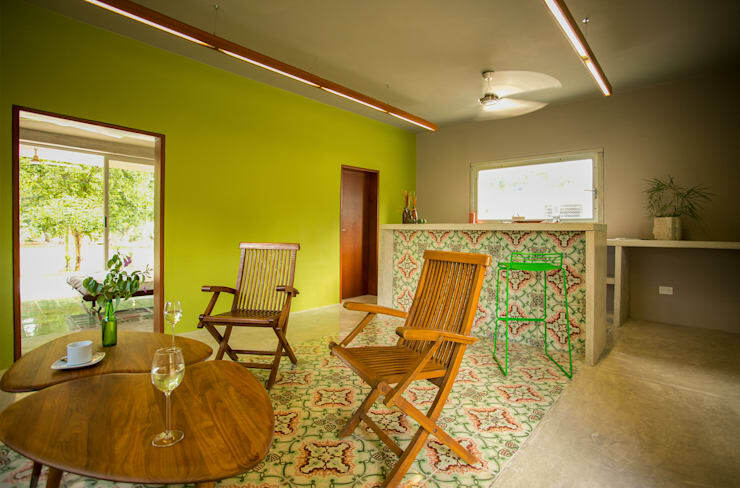 The patterned floor matches the lime green wall, adding colour and personality to the interior design of the home. This is a great tip! Use neutral walls throughout the home, but paint one a bright and bold colour. This way the colour won't be too overwhelming but will still look impressive and modern. The furniture is very simple in this space. If you don't have a large home, then this is a great tip! Go for less chunky or over-sized pieces to create space and breathing room in your home. Have a look at these: 6 stylish ideas for a small home. If we look at the dining room from another angle, we can see how space has been completely utilized. 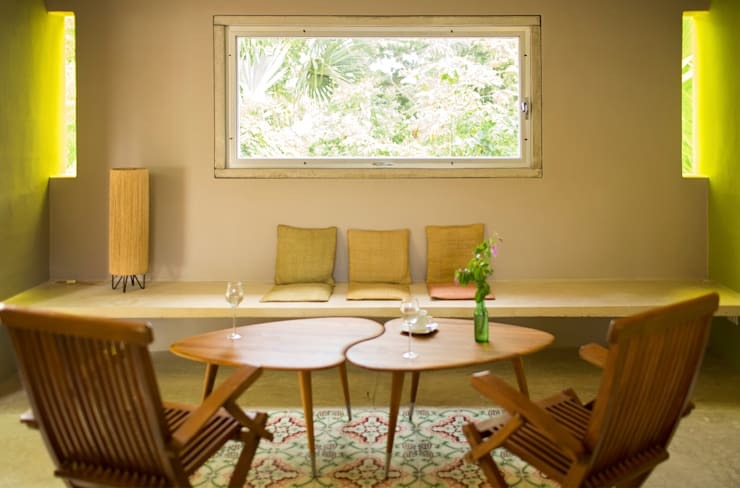 The designers have installed a bench along the wall, which works as a dining room seating area for guests as well as a surface for the lamp. How innovative and unique is the design of this space? The dining room tables are quirky and unique, fitting together like puzzle pieces. The only form of decor is a little vase of flowers, which adds a very subtle natural beauty to the room. The wall area is functional, but also very beautiful too! First of all it features a huge window, allowing diners perfect views of the natural surrounds. 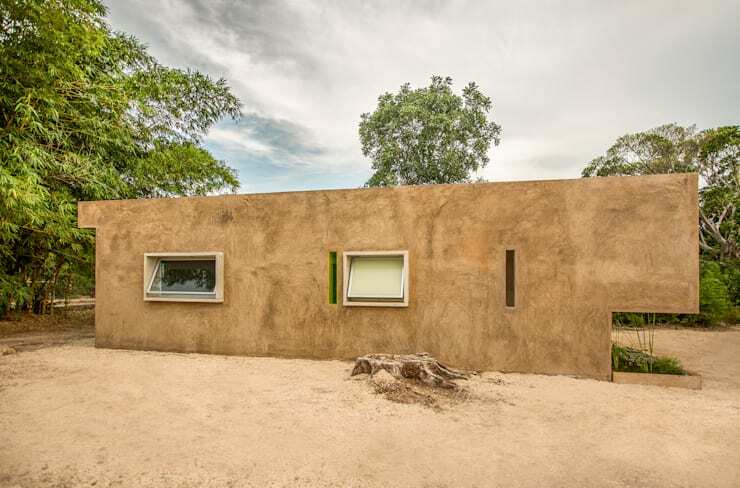 Secondly, it has two little sections that have been carved out of it on each side, which allows natural light to stream into the living room as well as ventilate the space. In summer, this is very important! The bedroom is one of our favourite spots in the house! It is charming, full of personality and character, yet remains a peaceful and tranquil haven to relax and regroup in. The designers have chosen to only include elements in this space that are functional and necessary, due to the limited space available. This allows for a room that is clear of any clutter or chaos. 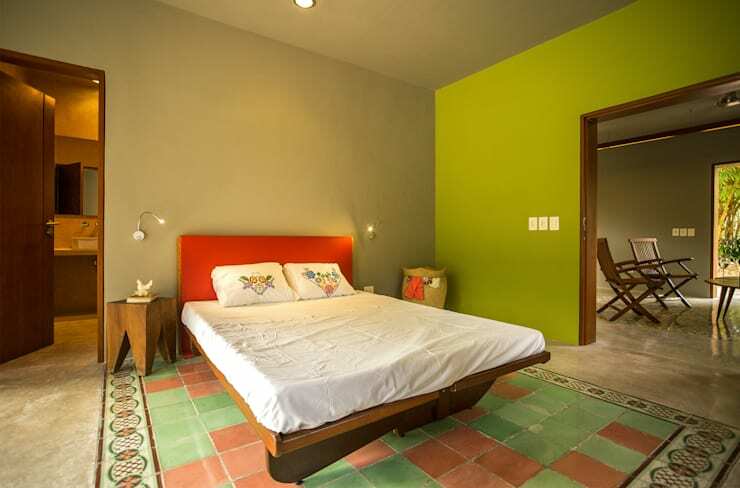 The style, personality and character are introduced very subtly in the form of a few colourful and detailed cushions, the ceramic patterned flooring, the lime-coloured wall and the orange headboard. Understated and sophisticated is the way to go! We can see that the bedroom flows through into the living space on the one side as well as the bathroom on the other side, keeping this home open and airy. We can also see that there is plenty of natural light in this space—a wonderful addition to any home. If we look at the front door to the home, we can see that a rustic design doesn't mean bland or thrown together. In fact, there is very careful attention to detail. In this image we can see how carefully the wooden door has been crafted so that it fits into this space perfectly. Above the door, there is also an artwork of sorts, which sets the tone for a very charming and quirky home before you even enter it. Remember that your home should be an extension of your personality so don't be afraid to include pieces of art or decor items that reflect your personality. We end off our tour looking at the structure from the outside again, where we can see how simple it truly is. It's not incredibly large or ostentatious. This is a reminder that sometimes it's the simple things in life that really can bring us the most joy. With a small home like this, there is so much room to get creative and innovative. In fact, when you are inside the home it doesn't seem nearly as small as it looks from the outside. As Walt Whitman said, The art of art, the glory of expression and the sunshine of the light of letters, is simplicity.